PIGEON FORGE, Tenn. (August 7, 2015) — Dollywood today announced the addition of Lightning Rod, both the world’s fastest wood coaster and the world’s first launching wood coaster. Set to roll to the starting line in March 2016, Lightning Rod adds another groundbreaking roller coaster to the park’s already impressive portfolio of world-class attractions. The thrilling $22 million ride also marks the single largest attraction investment in The Dollywood Company’s history. 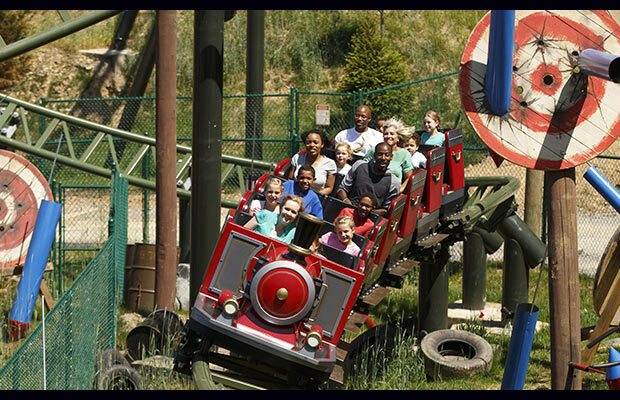 A highly awarded and widely recognized leader in the amusement industry, The Dollywood Company consists of the 150-acre Dollywood theme park; the 35-acre Dollywood’s Splash Country; Dollywood’s Smoky Mountain Cabins; and Dollywood’s DreamMore Resort. As unique as its namesake and owner Dolly Parton, Dollywood is the 2010 Applause Award winner, the theme park industry’s highest accolade; winner of nearly 30 Golden Ticket Awards; and recipient of 24 Brass Ring Awards for Live Entertainment (more than any other theme park in the world). In 2014, Dollywood was named a top three theme park by USA Today. Dollywood, celebrating its 30th anniversary in 2015, is open nine months a year (late March through early January) and offers rides and attractions, shows, and a dozen crafters authentic to the East Tennessee region. Dollywood’s Splash Country, recognized by the Travel Channel as one of the country’s most beautiful waterparks and named 2009’s Must-See Waterpark by the International Association of Amusement Parks & Attractions, operates from Memorial Day to Labor Day. Dollywood’s Smoky Mountain Cabins offers luxurious cabin accommodations overlooking Dollywood. The 300-room Dollywood’s DreamMore Resort provides guests spectacular mountain views and family-friendly amenities next door to Dollywood theme park and Dollywood’s Splash Country. For more information, call 1-800-DOLLYWOOD or visit dollywood.com. Operating days and hours vary.